Asian economies are grappling with ageing populations, which place government finances under strain while putting pressure on individual savings as an additional source of income in retirement. The impact is felt more in developed countries, which are at a more advanced stage of the demographic transition. Across the region there is growing macroeconomic pressure brought on by volatility in global financial markets and the sluggish pace of economic growth.As a result, many employees in Asia look ahead and see trouble on the horizon. Financial pressures on employees are pervasive. 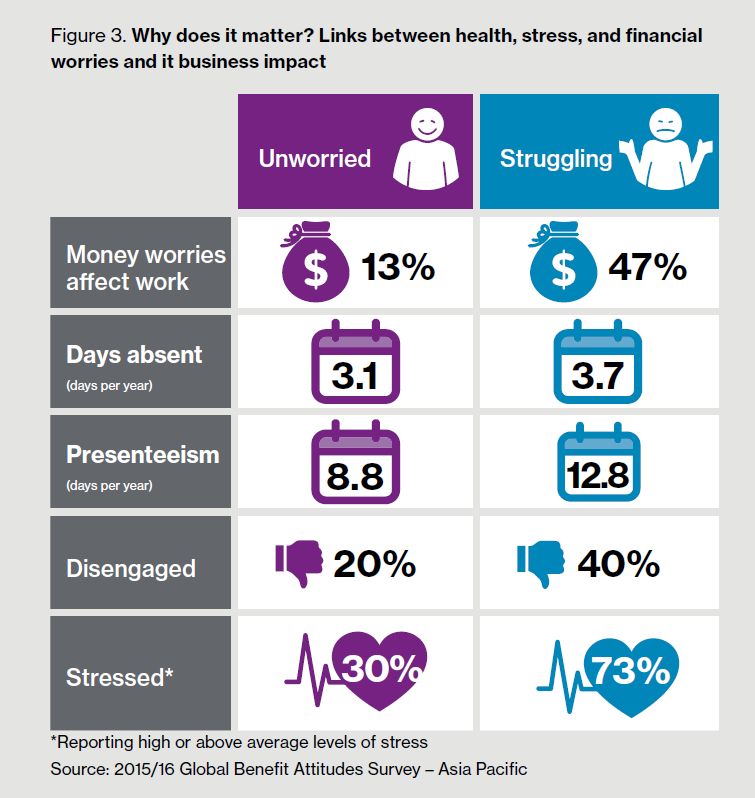 The latest edition of Willis Towers Watson’s Global Benefits Attitudes Survey (GBAS) showed that 43 percent of employees in Asia worry about their future financial state; and one in four say financial problems negatively impact their lives. Developed economies such as Japan and South Korea are at the forefront of this challenge, although all countries are affected to some extent. Further, Asian economies are grappling with ageing populations, which place government finances under strain while putting pressure on individual savings as an additional source of income in retirement. The impact is felt more in developed countries, which are at a more advanced stage of the demographic transition. Across the region there is growing macroeconomic pressure brought on by volatility in global financial markets and the sluggish pace of economic growth.As a result, many employees in Asia look ahead and see trouble on the horizon. Employees in the region’s most developed countries such as Japan, South Korea, and Australia are not confident they will have the same good fortune as previous generations. Nearly 75 percent feel the retirement and medical benefits covered by the state will not be as generous when they reach retirement. And just as many feel their generation will be worse off in retirement than their parents’ generation. Finally, less than half of employees in these countries are confident their retirement savings would be adequate should they face a prolonged retirement (25 years) (Figure 1). While sentiment is more optimistic in emerging markets such as China, India, or the Philippines, there are trends that suggest the future is not so bright. For instance, there has been a rise of a middle class that cannot rely on social security to cover retirement adequately. Other factors, including a rapid rise in life expectancy and changing family dynamics from traditional extended families to the modern nuclear family indicate that, in the future, there will be a larger financial burden on employees. In these countries, the demographic trends are shifting to a larger ageing population, but employees do not feel as much of a need to save for, or delay, retirement (most employees expect to work until the age of 60 or earlier) as their developed market counterparts. Earlier studies showed that employees in markets like India and China felt more compelled to save for life events such as their children’s marriage or buying homes than retirement. Demographic and financial challenges that affect retirement have increased the burden faced by employees for their own long-term financial security. This includes building up sufficient assets to cover them throughout retirement and managing investment risk along the way. Once they reach retirement, they need to figure out how best to draw down those assets in a way that supports them throughout their lives. For most households, this can be an overwhelming responsibility. In nearly all markets, there is a sense of vulnerability about retirement. If given a choice, half of employees would be willing to pay a higher amount of their paycheck each month to guarantee retirement benefits (Figure 2). Regionally, around seven in 10 employees rely on employer-sponsored plans for their retirement. “While employees feel vulnerable about their long-term security, the vast majority look to their employer to help solve the issue. In nearly all markets around the globe, two-thirds to three-quarters of employees say their employer’s retirement plan is the primary way they save for retirement. This trend will only grow stronger over time as concerns over the ability to fund retirement from other sources creep up. While many employees are willing to pay more out of their paycheck for more generous retirement benefits, employers may not be in a position to oblige, given the importance of pay to attracting and retaining top talent and the different priorities of their workforce — especially during these lean economic times. Frequently, we see the financial pressures of today crowding out the ability to save for the long-term. For many, tackling short-term issues is a pre-condition to tackling issues of retirement adequacy. “People worry about different things. This is partly tied to life stages — for instance, younger employees are more focused on saving for a house, paying off debt and meeting the costs of living day to day. In middle age, for many in Asia, the focus shifts to the costs associated with children and they start thinking about meeting their needs in old age. 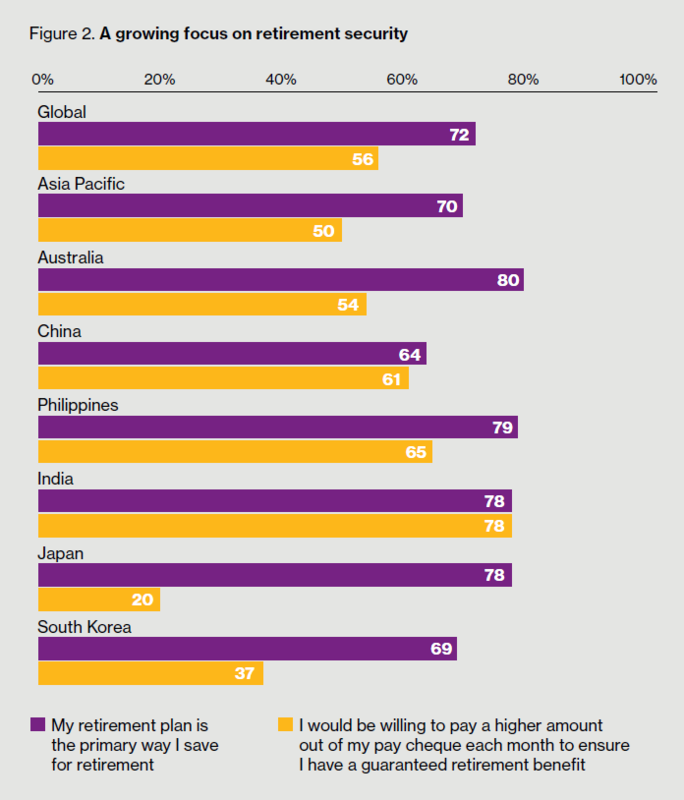 Older employees are more focused on saving for retirement,” explains Andrew Heard, Head of Retirement — Asia and Australasia at Willis Towers Watson. These differences are reflected in the preferences surrounding employee benefits – for instance, millennials favor more paid time off, flexible arrangements, and career opportunities. Those who are financially struggling wish to reshape their benefits and tackle immediate issues before focusing on their long-term needs, and thus prefer pay and bonus over traditional benefits. What impact do these worries have in the workplace? Around the world, we see that employees who struggle financially typically perform at a lower level than those who don’t (Figure 3). These pressures and distractions erode engagement. “In Asia Pacific, nearly half of employees who are struggling financially say money worries keep them from doing the best on their job. Many are willing to work past their retirement age out of necessity, in order to help mitigate the inadequacies of their retirement savings. These are so-called “hidden pensioners” — and they can impact business results as they are generally more likely to be unhealthy, more stressed and less engaged,” adds Heard. How can employers help their employees achieve better financial outcomes? Try to provide greater flexibility in how employer benefit spending is allocated. This is not an issue of raising employer spending, but ensuring the spending is more focused on employee needs. For example, should a young employee who is living paycheck to paycheck, and carrying debt (with a high interest rate), be saving for retirement instead of addressing their current financial issues? Employers can foster engagement in financial issues (and help employees address the financial issues they face) by promoting education and discussions (such as through group seminars or financial counselling), and by using communication from senior leaders to raise awareness and reinforce the importance of financial well being. Employers can use online decision support tools to help employees make decisions and raise awareness. These tools can help during pivotal moments when major financial decisions are being made — for instance, buying a car or home, debt consolidation decisions, etc. If employers do promote greater choice and flexibility, such tools will be needed to address the complexities of choice and ensure long-term needs are still addressed. An expanded role of the employer: How far, how fast? Personal financial issues are new territory for many employers and in many cases employees have not yet embraced their employer entering this aspect of their lives. Interventions to encourage extra retirement savings are considered invasive and not well received. In Asia, over a quarter of employees believe that it’s not the role of an employer to encourage their employees to better manage their household finances. And three in 10 are not comfortable receiving targeted or personalised messages on financial issues (Figure 4). However, this does vary by market. While employees in China, India, and the Philippines are more open to their employer getting involved, similar sentiments are not shared by employees in Japan, South Korea, and Australia. Employers need to build a role gradually, building brand permission among their employees. Employers can play a significant role to help employees deal with their financial burden. Doing so in a thoughtful way — which means taking into account employee needs, both inside and outside the workplace — could reap significant benefits, not only in terms of increased employee engagement and productivity, but also in terms of being perceived as an employer of choice. About the author: Willis Towers Watson (NASDAQ: WLTW) is a leading global advisory, broking and solutions company that helps clients around the world turn risk into a path for growth. With roots dating to 1828, Willis Towers Watson has 39,000 employees in more than 120 countries. We design and deliver solutions that manage risk, optimize benefits, cultivate talent, and expand the power of capital to protect and strengthen institutions and individuals. Our unique perspective allows us to see the critical intersections between talent, assets and ideas — the dynamic formula that drives business performance. Learn more at willistowerswatson.com.